Who doesn’t like a good (or bad *groan*) pun? They’re just punny! I love puns, although I admit I’m not great at making them up. Still, when I was offered the chance to have the new game Punderdome for free in exchange for an honest review, I jumped at the chance! My next task was finding at least 2 friends who’d play it with me. 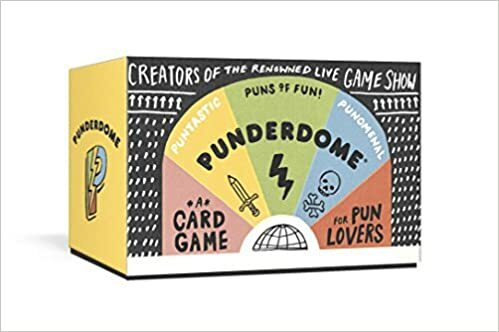 Inside the game instructions it reads: “In order to play Punderdome, you’ll need to gather at least two of your most pun-tolerant friends and/or relatives. Inform them they are about to play this game with you. Apologize later.” I didn’t realize how true that statement would be! We got started and got a couple of puns at the start, like “waitress” + “dessert”=”That waitress really took the cake!” but then it started to be bizarre and nearly impossible (for us) to make any puns. It’s hard to get into a game when you look around and all you see is a blank stare on every face. And that’s how it went. Here or there we could think of a pun, but mostly it was a wash. Maybe if you’re really in the pun frame of mind, this game will be fun…but it wasn’t fun for us. The best part of Punderdome was the punny jokes on the back of each card. They were good…but not good enough for me to recommend you buy this game for your next get together.